When my intended husband said he didn’t really like Christmas, I didn’t believe him. How could anyone not like Christmas? I loved Christmas. Christmas was wonderful when I was growing up. We had projects, and goodies, we had traditions. First of all, there was the music. I loved all the music of Christmas; it was what often bubbled up to the surface when I was happy, even if it might not be December. We were exposed to the majesty of Handel’s Messiah and had fun with “Rudolph the Red-nosed Reindeer,“ and learned carols from all over the world. We made wreaths or nativity figures or something most years. I was deprived, I suppose, because we didn’t make gingerbread houses. We always made some of our gifts, and did lots of baking. As an adult, I know it was a lot of work, but as a child it was wonderful. We started cutting our own trees one year, and it became a standing expedition in mid-December to go out to this spot in the country, choose and cut a tree, lash it to the top of the station wagon, and take our frozen selves to a country inn to have fried chicken and corn fritters, its specialties. Then we would get our tree home and inevitably discover that it was too tall, even for the highest spot in our cathedral ceiling. My father would cut off some of the base, wrestle it into the tree stand, and then it was time to decorate. 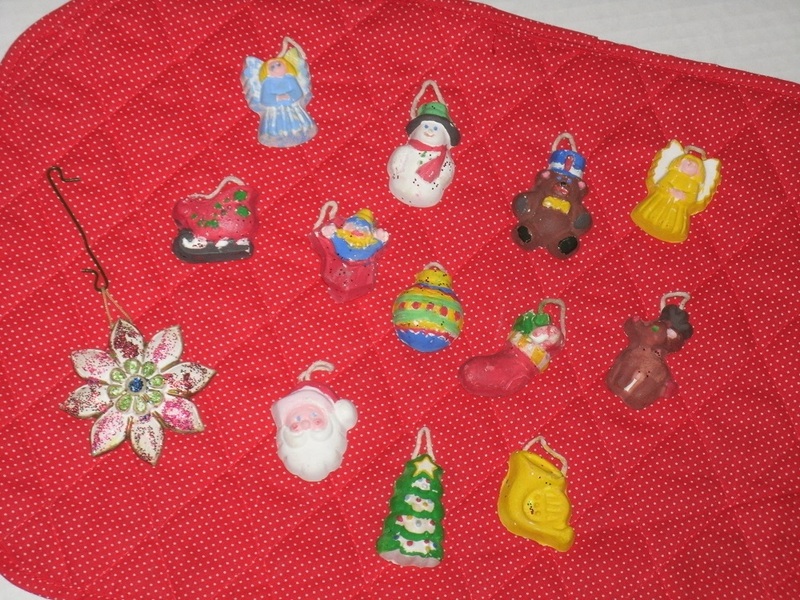 We made and painted plaster of paris ornaments, three of which I have now. We had bubble lights, which I still think are really cool. We had all kinds of balls, and strings of cranberries or popcorn, and tinsel to finish it off. We typically had the biggest tree of anybody I knew. Christmas was glorious. If you had a family, and you weren’t homeless or orphaned or the like, how could you not like Christmas? Well, I found out that my new husband was, in truth, not excited about Christmas. He wasn’t a bah-humbug cynic, but he didn’t have the boundless happy memories of Christmas that I did. His parents had an often rocky marriage, and Christmas tended to end up fraught with tension, leading to fights, because money was hard and they didn’t communicate with each other. So the contrast between the natural hopes of a child and the contrast between his reality and the excited anticipation of his friends could be painful. He never felt that his dad valued anything he gave him, even when he expended great thought and planning; once he even found his gift quietly put out on the shelf of his dad’s small store later, for sale. Ouch. He was willing to agree that he wanted to enjoy Christmas, and the key was having children of our own and making our own memories and magic. Finding the delight on his child’s face, getting something just right, made a Christmas convert out of him. Every couple has to blend their backgrounds, patterns, and traditions. Sometimes that can be a challenge. I lucked out, I guess, because in our case that was a cinch where Christmas was concerned. I outlined how we used to do Christmas Eve and Christmas Day in my family, and he added a couple of things, considered, and said, sounds good. So, on Christmas Eve we would go out driving and looking at Christmas lights, then come home and gather together in reverence for him to read the Christmas story out of Luke. We would follow with family prayer, and then send the kids to get ready for bed. Once that was accomplished, they would gather again and we would read, “The Night Before Christmas” and hang their stockings. We never had a fireplace or mantel, each child would get a chair or couch cushion, and their gifts from Santa would be there in the morning. Santa does not wrap presents in our house, life is too short. Wrapped presents go under the tree, and there was always one from Mom and Dad there, separate from Santa. 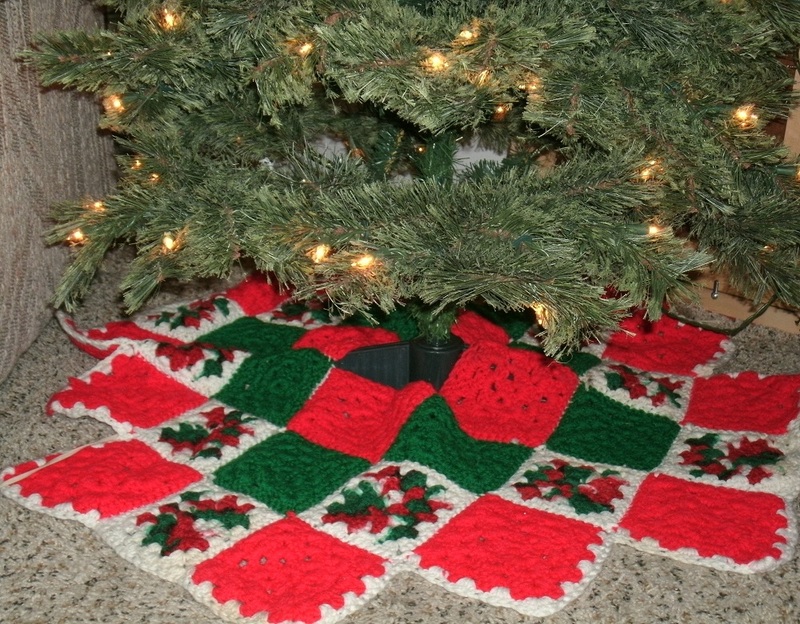 We bought this tree skirt at a school bazaar because it was made by a good friend when our kids were in elementary school together. It's made of simple granny squares. We now have an artificial, smaller tree, but it wouldn't be our tree without this skirt and its memories. The kids would gather together in somebody’s room and count down the time, giggling and whispering, until they were allowed to knock on our door and say it was time. Then they would line up (his rule) and go down the stairs. Breakfast came between stockings and the presents under the tree, so that I could take note of who gave what from the extended family and the whole process didn’t run riot. We made sugar cookies; the only time I make them is Christmas, and we tumbled onto painted rather than frosted cookies—you use evaporated milk and food coloring, maybe some accent sprinkles, and bake them as usual. Less mess and less sugar than frosted, and now our grandkids are making them too. We still go caroling to take baked goodies to our friends and I am now famous for pumpkin bread, something I had never heard of when I was a kid. Our table isn't complete without these colorful mugs. (There are eight.) They were a perfect gift to the family twenty years ago. I did cook a goose twice over forty years, and made fig pudding once. We found our own favorite foods and traditions. My sister gave us candy molds and plaster of paris to make ornaments one year, an echo of our own childhood project, and I bring them out for our tree still. Some are very precisely painted, some not, depending on the age of the child who made them, but I love them all. The larger ornament on the left, the poinsettia, is one I have from making them in my youth. The little ones are ones our kids made, the less-neat center ones by younger children, the careful detail evident on the other ones done by the older kids. 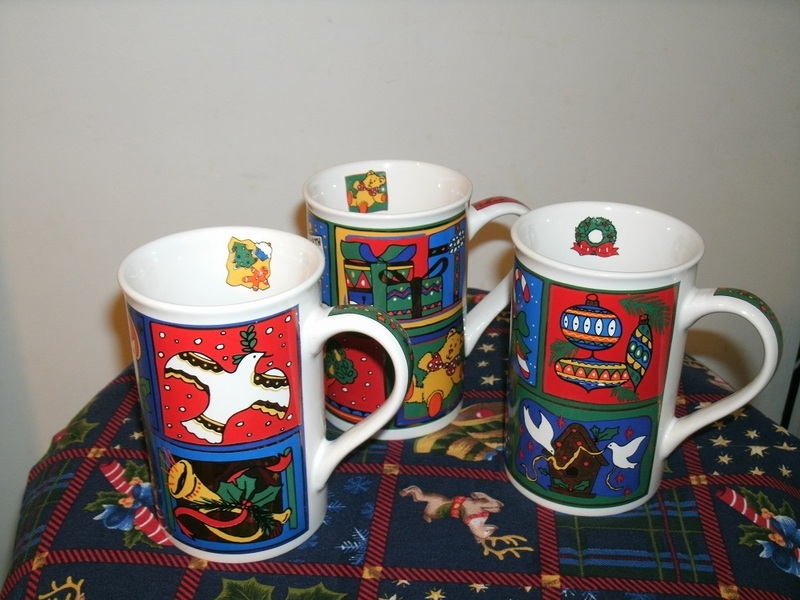 We have many gifts from loved ones that we continue to use for years. There are all kinds of ways of making Christmas. In this contentious, stressed-out world the value of shared family joy is more needed than it’s ever been. Christmas should be a magical season; it needs to be special. Making a Christmas centered around sharing, creating, and giving helps us remember and cherish the gift of the Christ child we celebrate.